Learn Japanese Woodcut Printing at the Center for Book Arts, November 7-December 12, 5 Wednesday nights, 6-9pm, $350. You should have put a ring on it…get some help with the Ring Making class at Liloveve, Saturday, October 20, 10-2, $179 (which includes tools and materials). Your floral snips will never be the same after a class with Christian Tortu. He focuses on Harvest Fruits and Flowers, October 10, 2-4, $400. The Intro to Woodworking class at Makeville, $495 plus $100 in materials/equipment, will give you mad skills. Different sessions of multiple classes, so you can start almost any time. Allegra Spread shares her tips in Drag Makeup 101 at NYC Resistor, September 28, 7pm, $100. Make a statement taking the Power Pages calligraphy class with Barbara Close, Sunday, November 4, brought to you by the Society of Scribes, held at the SVA Annex. 10-4, $100. 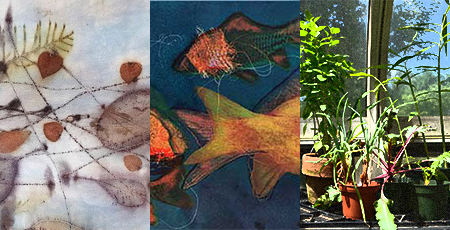 Learn how to create a Botanical Print Silk Scarf on Sunday, October 21, 11-4:30, $180 at 92Y.